SUGAR/NUSIANCE ANT CONTROL - "We kill what bugs you!" 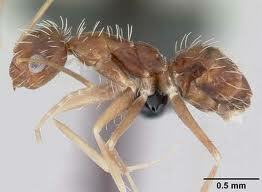 Odorous House ants are another common ant in our area of Texas. It gets its name from the pungent, "rotten -coconut like" odor given off when it's smashed. They typically live inside of wall voids around hot water pipes and heaters, around sinks, cupboards, etc.. Outside they will live in the nest of larger ants mostly under objects. Odorous House ants prefer to feed on sweets such as honeydew but will also eat foods high in protein and grease such as cheese and meats. Once again locating the nest is very important when trying to treat for theses ants. Eliminating the available food source is very important as well for a succesful treatment. Give us a call, whether you just need a onetime treatment or are on a Monthly or Quarterly Treatment Program we've got you covered. Crazy ant is probably a general term most people use to describe the behavior of most ants, however there is a particular species that has officially won the title of "Crazy Ant". We do occasionally see colonies of these ants in central Texas. They do not typically have large colonies but do tend to nest mostly inside of a structure. Wall voids, under floors, and around pipes and water heaters. They prefer sweet foods but will feed on most any household food source. As with most all ant species it is important to locate the colony for proper treatment as well as eliminating all food and water sources. Give us a call, whether you just need a onetime treatment or are on a Monthly or Quarterly Treatment Program we've got you covered.